I viewed the DVD by Dr Randall Smith GOD ANSWERS BY FIRE yesterday and I was thrilled. Firstly I loved the visuals of that part of Israel which I visited myself a few years ago. I had a great sense of nostalgia and a longing to go back there. I was also very pleased with the excellent quality of this production. Praise God that He has given Naas and your ministry the skill and gifts to produce teachings of this quality. 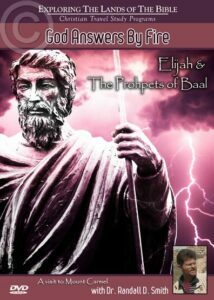 Most important for me, however are the spiritual lessons to be learnt from Elijah’s experiences. The Holy Spirit has often drawn me to these chapters of Scripture to strengthen and encourage me and to trust Him completely, no matter how great the storms of life appear to be. May the Lord bless you, Naas and your team and keep you in His perfect peace. I pray for you Isaiah 26:3: “You will keep him in perfect peace, whose mind is stayed on You, because he trusts in You” (NKJV).